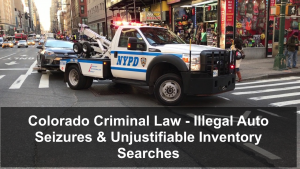 Colorado Criminal Law – Illegal Auto Searches &Unjustifiable Inventory Searches – Every search under Federal and State Constitutional law requires that a search warrant is obtained unless the search comes within an exception to the warrant requirement. One such exception is the so called “inventory search” exception. Two recent (2018) Colorado Supreme Court cases narrow the grounds for the use of the inventory search as a pretext to illegally search a vehicle when there are no legitimate policy based reasons to support a seizure of the vehicle and an inventory search of that car. If contraband was found such as illegal to possess controlled substances during these so called “inventory searches,” charges would be filed against the owner or possessor of the car. In the Brown case, the police received an anonymous report of a suspicious person driving a gray BMW in the area. The Aurora police found Brown’s gray BMW and observed Brown fail to stop at a stop sign. Brown was pulled over and issued a ticket for driving on a suspended license but did not arrest him. Utilizing a routine police procedure authorized under Aurora law, the police decided to impound his vehicle and then inventory the BMW’s contents – finding several bags of cocaine. Brown was arrested and charged with the drug felonies. In the motion to suppress the seized drugs hearing based on an alleged illegal search, the Prosecution argued that Aurora’s police policies and procedures granted the officers the right to conduct an inventory search and the search was not pretextual, … even if the officers hoped to find evidence of a crime. The grounds asserted for the seizure and search of the car in the Brown case was based on a loosely understood concept of the “community caretaking” function performed by the police. …is not concerned with potential criminal activity, but rather with administration of the risk to public safety threatened by the vehicle. The fact that an impoundment complies with a state statute or police policy, by itself, is insufficient to justify an impoundment under the community caretaking exception. The primary purpose of the community caretaking function of the police is protecting against danger or loss in the seizure of private property and includes the risk of false claims of loss against police departments. …in the absence of an arrest, seizing the defendant’s vehicle so as to provoke an inventory of its contents could not be justified as an exercise of the police caretaking function, and in the absence of any other recognized exception to the probable cause and warrant requirements of the Fourth Amendment, violated its prohibition against unreasonable searches and seizures. Because the District Attorney could not provide A REASON to impound the car other than the inventory search was authorized by Aurora police policy and procedure it did not matter that the police followed their department’s inventory procedure. The officers lacked justification for taking the vehicle into the cities’ custody in the first place. Stated differently, the State failed to prove that the seizure of the Defendant’s vehicle was justified as an exercise of the police caretaking function or was otherwise reasonable within the meaning of the Fourth Amendment. There was no threat to public safety by leaving the car accessible to the driver. As of the Brown decision by the Colorado Supreme Court – right now – even if police officers have reason to suspect that the driver who is ticketed will unlawfully drive the vehicle upon the departure of the police from the scene, the community caretaking exception to the probable cause and warrant requirements of the Fourth Amendment WILL NOT support the seizure and inventory search of the car on the basis of suspicion that the Driver has committed, is committing, or will commit a crime. The deterrence rationale underlying exceptions to the warrant requirement of the Fourth Amendment is incompatible with the principles of the community caretaking doctrine. After Brown, there is an important distinction between two different law enforcement decisions. First, is the decision to seize the car – and Second is the decision to search/inventory after the seizure. If the police make the decision to seize your vehicle, it must be based on a reasonable belief that that seizure is necessary to protect the your property, …the police from liability for that property, or the public at large being placed in danger of a hazardous condition created by the car. Even where the police have a “reason to suspect” that an arrested person might unlawfully drive the vehicle after the police leave, this factor alone no longer justifies the seizure and impoundment of a vehicle under the community caretaking function. The arrested driver scenario is a harder case for the Defendant because it is clear that the arrested individual is temporarily deprived of the immediate custody and control of their vehicle. But even when a person is placed under arrest – that fact alone – does not automatically authorize the government to seize and take custody and control of the suspect’s vehicle. The issue is whether, as a result of police action, the person arrested is rendered unable to protect the vehicle or its contents. 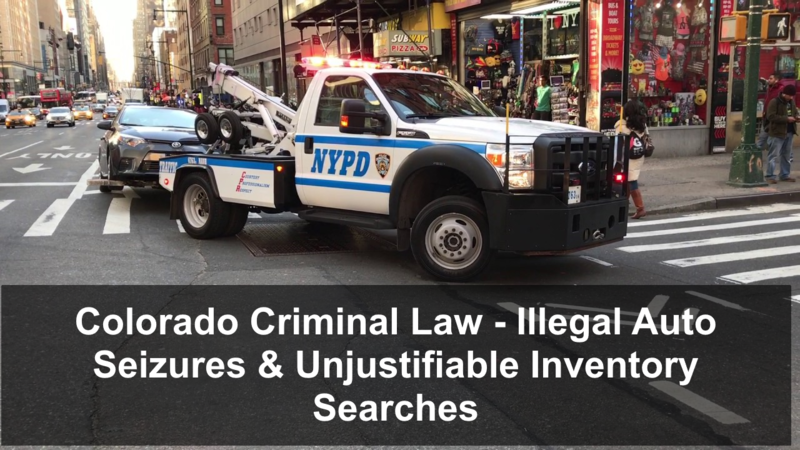 After the Brown case, Colorado Courts are required to apply certain factors when determining whether it is reasonable for the government to seize and then search a vehicle. 3. Whether another person, authorized by the arrestee can take possession of the vehicle. The Government must present evidence that the seizure of an arrested person’s car was necessary to protect his property, the police from liability, or the public at large from a hazardous condition. To the contrary, the Government must articulate some reason to believe that inventorying is necessary to protect the individual’s property or the police from liability. Unless such a showing can be made, the impoundment and inventory search of a vehicle may violate the dictates of the Fourth Amendment. In examining the reasons alleged by the police to support a seizure and inventory of a vehicle in an arrest setting, the ultimate issue remains whether the impoundment and subsequent inventory serve an administrative community caretaking function. Does this seizure of the car meet any of the factors or purposes for which a community caretaking exception has been recognized supported the impoundment of the defendant’s vehicle? Is there evidence that the car in question is impeding traffic or threatening public safety? Is the car inoperable or otherwise unable to be safely and legally removed by a licensed party? Was the Defendant offered the option to have the car safely left at the scene or privately towed? Where the only justification offered by the police for seizing a car is the likelihood that the Defendant might continue to drive that vehicle and thereby endanger public safety, the initial seizure of his car still did not fall within the community caretaking exception to the probable cause and warrant requirements of the Fourth Amendment. ….because the community caretaking exception can apply only to conduct that is distinct from the investigation of criminal activity, a seizure premised solely on the risk that the vehicle will be driven illegally, by a driver cited for driving on a suspended license, can never find justification as a community caretaking function. Furthermore, the Brown court found that – merely complying with a departmental policy or procedure on seizing and inventorying vehicles – is insufficient in and of itself to bring a seizure of a vehicle within an exception to the Fourth Amendment warrant requirement. For example, as noted, seizing a vehicle to prevent the driver from continuing to drive with a suspended license does not fall within the specific community caretaking exception. The “common practice” of the seizing and inventorying vehicles by Colorado police departments may be unconstitutional. For a search and seizure to be considered reasonable within the meaning of the Fourth Amendment, it must either be authorized by a warrant supported by probable cause or it must fall within a recognized exception to those requirements. In any specific case, unless the Government provides evidence that demonstrates that a seizure of a Defendant’s vehicle is justified as an exercise of the police community caretaking function (or is otherwise reasonable within the meaning of the Fourth Amendment), notwithstanding local laws or police policies and procedures broad enough to grant the officers discretion to impound the vehicle of a driver, an automobile can not be seized and searched. If a vehicle is impounded and subsequently inventoried in the absence of such evidence, it may directly violate the Fourth Amendment’s prohibition against unreasonable searches and seizures. H. Michael works hard to get his clients the best possible results in and out of the courtroom. 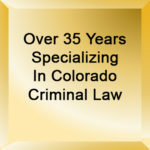 He has written, and continues to write, extensively on Colorado criminal law and he hopes this article helps you in some small way – Colorado Criminal Law – Illegal Auto Searches &Unjustifiable Inventory Searches. Every search under Federal and State Constitutional law requires that a search warrant is obtained unless the search comes within an exception to the warrant requirement. One such exception is the so called "inventory search" exception. Two recent (2018) Colorado Supreme Court cases narrow the grounds for the use of the inventory search as a pretext to illegally search a vehicle when there are no legitamate policy based reasons to support a seizure of the vehicle and an inventory search of the car.